Occasionally, a play dispenses with the traditional stage-far-removed and opts for a more integrated format. Actors move among the audience, sometimes even involving audience members in the play itself. 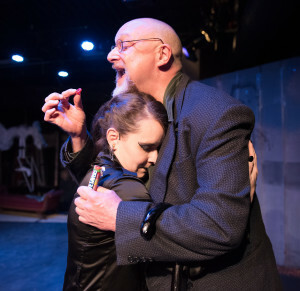 Quill Theatre’s Stupid F—ing Bird, performed at Richmond Triangle Players and directed by Jon Kretzu, removed the physical and psychological separations between actor and audience resulting in a surprising and unforgettable experience. I knew something was up when Audra Honaker (Mash) gave us a warm greeting at will call, and Jeremy Morris (Trig) showed us to our seats, complimenting us on our stylish outfits. Upon entering the playhouse, one immediately notices the sideways orientation of the stage running through the middle of the space and into the riser section, bisecting the room like a table runner. The ceiling twinkled amidst soft lighting, while the remaining actors milled about. We’re not in Richmond anymore, folks. The delightful surprises keep coming, most notably the performances of this superbly talented cast. Normally I would expect to just savor in the finesse of Richmond veterans David Bridgewater (Sorn) and Audra Honaker, but the remainder of the cast (Jeff Clevenger as Dev, Chandler Hubbard as Con, McLean Jesse as Nina, and Katie McCall as Emma) were equally impressive. I’d be hard-pressed to identify any one standout given the stellar performances all around. 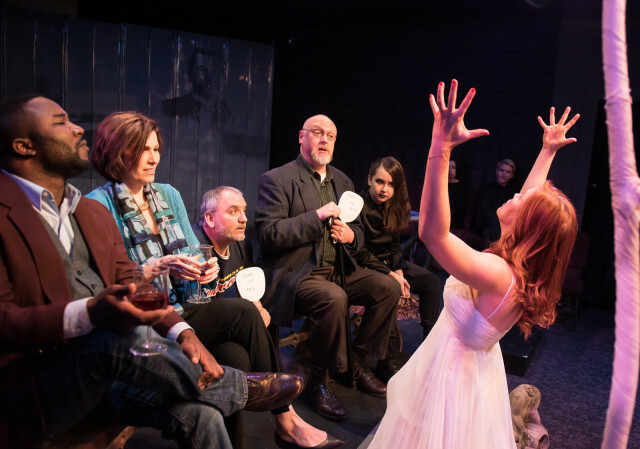 Loosely inspired by Chekhov’s classic play, The Seagull, Aaron Posner’s Stupid F—ing Bird has a provocative, poignant message that reminds us that the richness of our lives depends not on our level of cheer, but instead on our ability to give and accept love. The porous interface between audience and ensemble reminds us that their lesson is our lesson; their story is our story. Stupid F—ing Bird felt like we hit the proverbial theatrical jackpot: a visual treat, spellbinding performances across the ensemble, and a message to the heart. It will capture your heart. Don’t miss this delightful play, recommended for high school students and adults due to adult themes and language. Stupid F—ing Bird runs through January 30 at Richmond Triangle Players. For showtime and tickets, visit Quill Theatre.